Our web store features a sampling of bestselling items that you'll find at our harborside store on the south shore of Lake Superior in Bayfield, WI. If you don't see what you're looking for on our website call or send us an e-mail. Bayfield is a quaint community on the south shore of Lake Superior, the greatest of the Great Lakes. We are the departing point for access to the Apostle Islands, a pristine archipelago of twenty-two islands. Twenty-one of those islands and twelve miles of mainland shoreline comprise the Apostle Islands National Lakeshore, home to six light stations with a total of eight lighthouses. 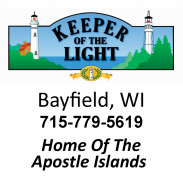 For information about lodging, dining, attractions & events in Bayfield, WI visit the Bayfield Chamber of Commerce.